During last Tuesday's election night shellacking, I surfed around the cable channels and caught a bit of Sarah Palin on Fox News. I haven't actually listened to Palin much in the past two years, though I've followed commentary on her speeches. I was surprised. She has become much more polished and professional in the past two years. She looked more like a real politician than a cartoon character. While not all of Palin's picks won on Tuesday, there's no question that she came out of this election cycle as a real power player. 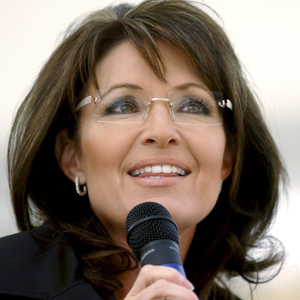 The big question is, of course, will Sarah run for office in 2012? Someone asked David Gergen that question this week, and he said that he didn't think so. He thought she was having too much fun and making too much money right now. She wouldn't want to really embarrass herself and go through the drudgery of a campaign. She has her reality show after all. Dad said that he thought that she wouldn't be able to resist. She would win a nomination and then lose the election. Question of the Day: Will Sarah run? Let’s hope so. I’m with your dad, she has a lot of hubris and it is very hard to resist the temptation. She has the sectarian’s addiction to speaking to the converted, which is a lot of fun, and will screw it up if she gets the nomination. She might run, but she won’t get the nomination. She left her last political job early and didn’t even get her own guy in the Senate race in her home state. I think that Sarah Palin probably doesn’t want to do the work of the president. She might want to be president for the power and prestige, but I don’t think she wants to do all the stuff you have to do to actually be an effective executive office holder. So, “will she run” will depend on how self-aware she is, and how much power and prestige she can grab on to in the next year or so in her current role. It’s kind of fun being a “king-maker” who just makes speeches where people cheer at you.